Biography Adolph (Adolf) Guttmann was born on August 1, 1854 in Kraków in Galicia, in the Austrian part of Poland. After finishing his studies in Berlin and Vienna, he became Rabbi in Hohenems in 1877, where he served the community till 1883. He was a convinced member of the Reform movement and was ready to fight for his beliefs. He worked as a co-editor for the Jewish review "Reform" and contributed to other jewish-progressive periodicals. In 1880 he allowed the women to take place in the regular pews of the Hohenems synagogue, on the right side of the auditorium. The womens gallery was dedicated to the choir. When the synagogue in St. Gallen was inaugurated in September 1881 his sermon provoked harsh criticism in the orthodox camp, i.e. in the orthodox review "Der Israelit". In 1883 Guttmann moved accross the Atlantic to serve as rabbi of the Concord Society in Syracuse, upstate New York, succeeding Rabbi Herman Birkenthal who had served the congregation from 1875 until 1882. Dr. Guttman helped establish most of the lasting Jewish community institutions in Syracuse, organizing and training the first modern temple choir, and modernizing the religious school. He also negotiated the Temple’s joining the Union of American Hebrew Congregations. In 1891, during the presidency of William Henocksburg, Dr. Guttman formed the Ladies Aid Society, which established the United Jewish Charities, later known as the Jewish Social Service Bureau (SOC, 16-17). Guttman also promoted the idea of a Y.M.H.A. which became the Jewish Community Center. In 1901 Guttmann convinced the president of the congregation, Gates Thalheimer, to build not only a new religious school but a new temple. 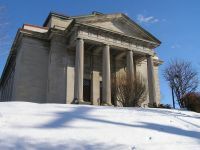 The building, designed by architect Arnold W. Brunner, a descendant of the Hohenems Brunner family, was dedicated on September 22, 1911 at what was a major ecumenical occasion in Syracuse. Rabbi Guttmann served Temple Concord till 1919. He also was professor of Semitics at Syracuse University. He died in New Haven on August 3rd, 1927. His motto was: "Creed and Deed." He once said, "In our religion we are Jews, but in every other respect we are part and parcel of this great country, which we love with heart and mind. Its flag is our flag, its victories our victories, its defeats our defeats." An dieser Synagoge war Adolf Guttmann von 1883-1919 als Rabbiner tätig. "St. Gallen, 23. September (1881). Verflossenen Mittwoch fand die Einweihung der hiesigen, neuerbauten Synagoge statt. Herr Rabbiner Dr. Engelbert hielt die Festrede und fand nicht nur bei den jüdischen, sondern auch bei den zahlreich erschienenen nicht-israelitischen Zuhörern, großen Beifall. Am Schlusse der Feier fand eine Kollekte zum Besten der Unglücklichen von Elm statt, welche die erkleckliche Summe von 1.265 Franken ergab. ’Die hiesige israelitische Gemeinde,’ schreibt das Tagblatt von St. Gallen, ‚hat hierdurch ein Zeugnis davon abgelegt, dass sie weitherzig und opferfreudig ihrer christlichen Brüder gedenkt und die Lehren ihrer Religion in einer Weise ins praktische Leben überträgt, die auch den Bekennern des christlichen Glaubens ungeteilte Sympathie abringen muss. Noch schlimmer trieb es Herr Dr. Gutmann, Rabbiner zu Hohenems. Er sprach gegen die alten Formen und Satzungen des Judentums und forderte dazu auf, die talmudische Auslegung zu verwerfen, von der die mosaischen Gesetzgebung nur die ewigen Wahrheiten festzuhalten, die Formen zu zerbrechen und die Schalen wegzuwerfen etc. etc. Schöne Rabbinen!"